Of all the diverse landscapes throughout California, the 25,000 square miles of desert terrain offer, perhaps, the sharpest contrast yet delicate balance between harsh environments and the existence of life. The desert is mysterious, perplexing, cruel and engaging. Well, guess what? So is golf! Yet, golfers and this vast, dry wilderness manage to coexist in graceful, although sometimes unforgiving, harmony. Framed by the San Jacinto, San Gorgonio and Santa Rosa mountain ranges in Southern California, the acclaimed Coachella Valley, less than two hours east of Los Angeles, is synonymous with desert golf. From a bird’s-eye perspective, it’s a masterpiece puzzle of more than 2,000 green shapes and sizes linked by a magnificent desert oasis. What began in 1951, with the Thunderbird Country Club in Rancho Mirage as one of the first desert golf properties, has now blossomed into a region with one of the highest concentrations of golf courses on the planet. There are more than 125 courses here—a number very close to what the thermometer might register during peak summer—spread throughout neighboring golf havens in Palm Springs, La Quinta, Palm Desert, Rancho Mirage and Indian Wells. For more than a half century, it has been one of California’s unique vacation retreats and a popular getaway or residence for celebrities, including icons such as Frank Sinatra, Bob Hope and Dinah Shore, all of whom proved to be instrumental in pushing the sport forward with the creation of three major golf tournaments: Frank Sinatra Celebrity Golf Tournament; PGA TOUR Bob Hope Chrysler Classic (now the Humana Challenge); and the LPGA Kraft Nabisco Championship. The rugged and dramatic landforms and sensational vistas that combine to make desert golf so unique have also attracted a who’s who of golf course architects to this legendary playground. The likes of Jack Nicklaus, Pete Dye, Greg Norman and Arnold Palmer have planted more than 250 miles of fairways and greens into this golf kingdom. Regardless of skill level, this much grass should keep golfers driving the desert straight-aways and doglegs for quite a while! If you were to commence your golf journey on the south end of the desert arena in La Quinta, you could be teeing off at one of the top-rated courses in the country, PGA West Stadium Course. As a longtime host venue to the Skins Game and PGA Tour Qualifying School Finals, this desert golf landmark offers plenty of dune bunkering and nine water holes, as inspired by the famed Scottish seaside courses. Also in La Quinta, at SilverRock Resort, Arnold “The King of Golf” Palmer brought 7,578 yards of fairways and greens to life (the longest layout in the desert region and one of the longest on the PGA Tour when it hosted the Bob Hope Classic, 2008-11) with massive native bunkers and astonishing water features set against the backdrop of the Santa Rosa and Coral Mountains. Crossing the border to the town of Indian Wells, just 20 minutes from Palm Springs International Airport, you’ll find one of California’s premier golf destinations, Indian Wells Golf Resort. With the newly transformed Players and Celebrity courses, this property can boast the distinction of being the only 36-hole public golf facility with both courses on Golfweek’s “Best Courses You Can Play” in California. Combined with a lighted, 9-hole, natural grass putting course and a brand new 53,000-square-foot clubhouse, this “muni” golf experience is unparalleled. Moving up Highway 10 that spans the length of the Coachella Valley, Palm Desert is home to approximately 30 golf courses. 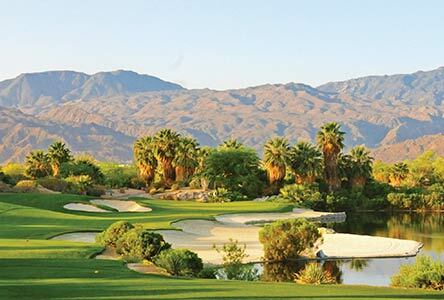 Two outstanding options are at Desert Willow Golf Resort with the Firecliff Course, providing a stern test for golfers to negotiate around extensive natural areas, more than 100 bunkers and plenty of water hazards, or the less demanding Mountain Course with wider fairways and plenty of scenery for snapshots. The nearby Classic Club, another Palmer design, spreads throughout 240 acres of rolling terrain with no housing development in sight and no palm trees; instead, you’ll find an abundance of pine, olive and pepperwood trees providing a Northern or Midwestern feel in the desert. Next door in Rancho Mirage, the family-friendly Rancho Las Palmas Resort & Spa features three distinct nine-hole layouts designed by Ted Robinson, all of which make golf an enjoyable activity for low and high handicappers. Last stop on the golf trail heading up the Coachella Valley is Palm Springs, a town rich in history offering a great mix of old and new along with more affordable golf than the other end of the valley. This is evident at Jack Nicklaus’ Escena Golf Club, a modern gem that, along with the contemporary clubhouse, is reminiscent of what made golf great in the desert. At nearby Tahquitz Creek Golf Resort, in addition to the Legends Course, Ted Robinson designed the desert links-style Resort Course with no shortage of his signature waterscapes. For extreme adventurers, the ultimate California desert golf experience is a three-hour drive northeast from Palm Springs to Death Valley, where Furnace Creek Golf Course, one of Golf Digest’s “America’s 50 Toughest Courses,” sits as the world’s lowest elevation course at 214 feet below sea level! No matter where you tee up in the desert, there are some common-sense rules to follow: always have water on hand to stay hydrated; don’t search for lost balls in the desert so you’ll avoid contact with the vegetation or wildlife in its natural habitat; wear a hat and sunscreen. Adhere to these guidelines, and the beauty and challenge of these world-class golf courses will keep you entertained for days.